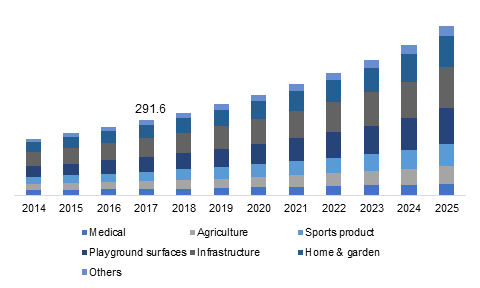 The global recycled elastomers market share will surpass US$ 6 billion by 2025, according to a new study published by Global Market Insights, Inc. In terms of revenue, the recycled styrene butadiene rubber market will register a compound annual growth rate of 13% over 2018-2025. Driven by the increasing investments in construction projects, recycled elastomers market share from infrastructure applications will surge approximately 10% during the forecast period. In terms of volume, the Asia Pacific region’s recycled elastomers industry will record a year-on-year growth rate of 13% between this year and 2025. In America, almost 300 million tyres are scrapped on an annual basis; and around 52% of these are used for making tyre-derived fuel. In fact, end-of-life tyres are an interesting sources of energy in the U.S. as they produce close to 1,065.6 trillion kilo joules of energy per year. This equates to roughly 17 million barrels of crude oil. The improving living standards in economies around the world will further boost the recycled elastomers market demand, so say analysts at Global Market Insights. They cite the expanding home & gardening sector as another ‘major driving factor’ fueling the demand for recycled elastomers. Reportedly, in the year 2017, the United States home and garden market was worth US$ 272 billion and is expected to surge by another US$ 10 billion by the end of this year. The new report includes an in-depth assessment of the business prospects of several key players, including; GRP Ltd., Liberty Tire Recycling, American Tire Recycling, West Coast Rubber Recycling, Monmouth Rubber & Plastics Corp.